Your baby is now smiling and cooing and will soon start to move around more. These are signs of your baby’s personality and the start of a lifelong learning process. Even very tiny infants act in very individual ways. Some are loud and active, others are quiet and passive. Some are easygoing and cuddly, others are very serious. Some are relaxed, others are more high-strung. As a parent, you already know your baby’s unique personality. If your baby is sensitive to changes in routines, make sure that your days are not too busy or filled with lots of changes. If your baby’s personality is different from yours, remember that what makes your baby comfortable and happy may not feel right for you. Colic This is not caused by anything you have done. This usually goes away at about age 4 to 5 months. Trouble Sleeping Some infants will have trouble either falling asleep or waking up often during the night. Clinging To Parents When infants don’t see certain people (even close friends and grandparents) very often, they may become afraid of them. Just like adults, infants do best with happy and healthy people around them. Look for parent/baby groups, support groups, or organizations in your community where parents with common interests can meet and get to know each other. If things are not going well in your family, if you need help finding groups in your neighborhood, or if you are worried about your baby, talk with your pediatrician. You are not alone; many other parents have these same concerns. 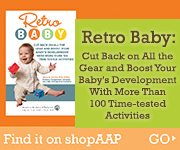 Now that you are beginning to know your baby’s patterns, your family, like many others, may be starting new routines. Here are some tips to help you. Even though infants usually are lovable, most parents have moments of frustration, and even anger, with their baby. Feeling this way is common and normal. What is important is how you deal with these feelings. When this happens to you, place your baby in a safe place like a crib or playpen and do something to relax and calm down—have a cup of tea or coffee, listen to music, call a friend or spouse, read, or meditate. These feelings of stress are natural and will pass.